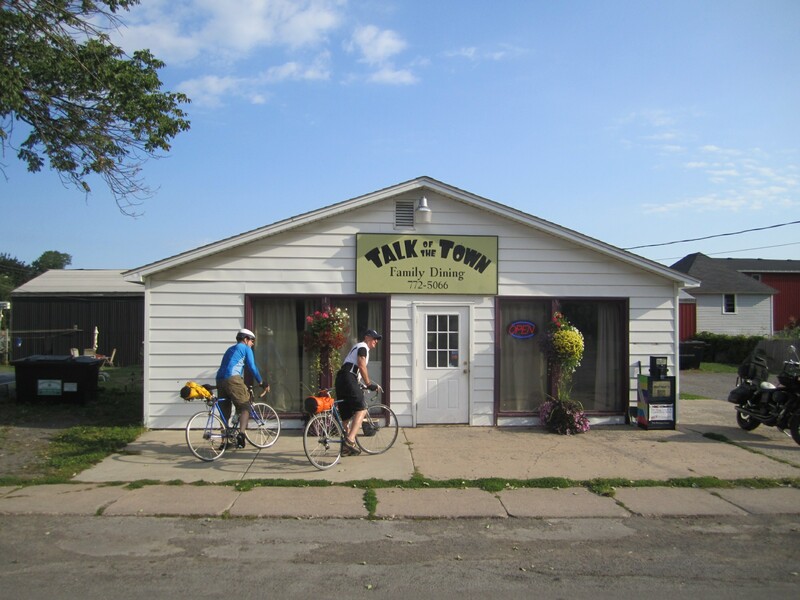 This is a story about a bike ride, the buildings we saw, and about the people. 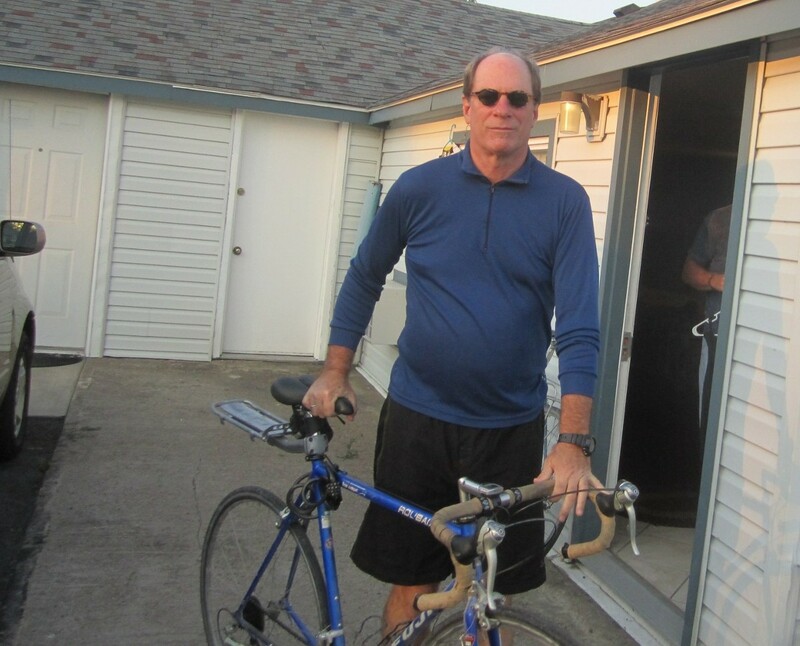 Since I did not do this alone, this ride was about Lyman and Steve. 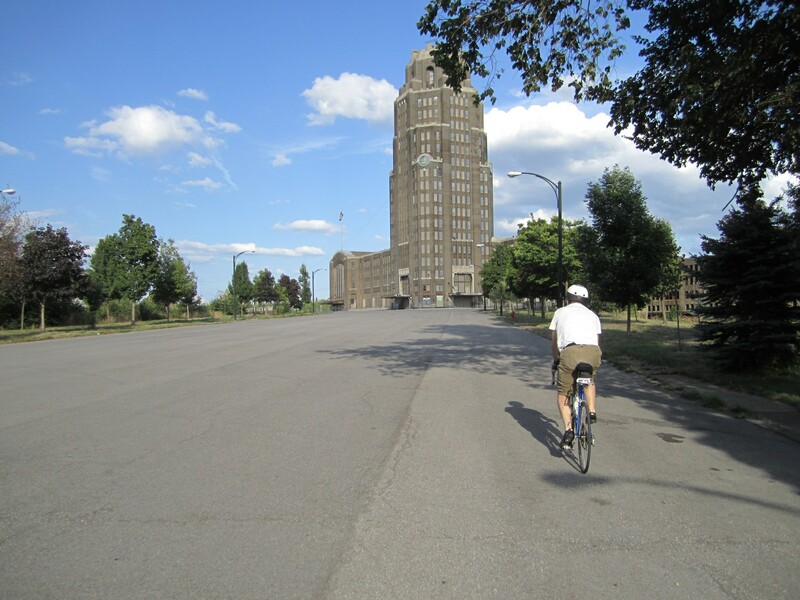 We rode about 190 miles in five days, Buffalo to Rochester to Syracuse, old industrial cities along the old Erie Canal. 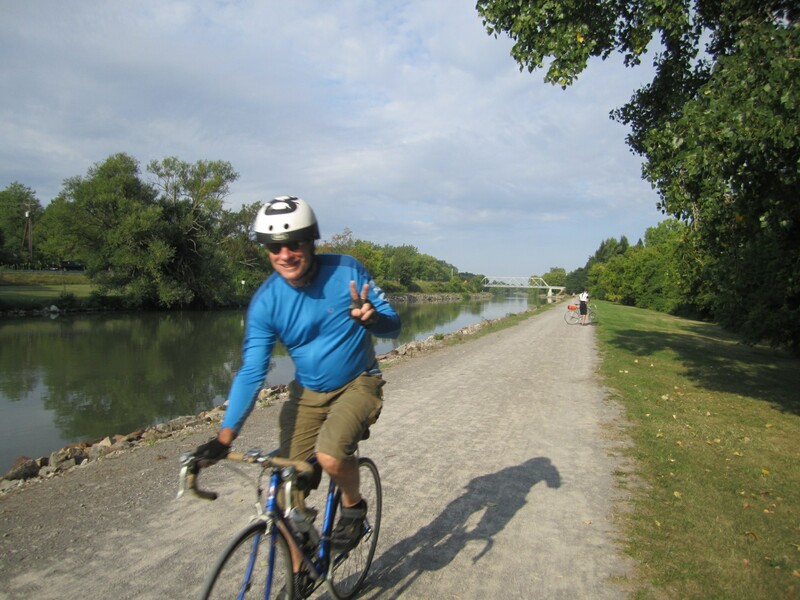 The Erie Canal authority does a good job of maintaining a bike path on this route. Since the Erie Canal has been rebuilt several times in sections, the path moves around. Most of it follows the current canal, but in other places it follows abandoned canals, or country roads and former rail lines. They say you should not talk about politics or religion. Steve, Lyman, and I pretty much agreed on politics anyway, but on this trip we had several discussions about religion, usually over cocktails. We had a particularly testy exchange over house rye whiskey at a dark bar in Syracuse. Steve, as usual, was defending God. This trip went through areas that seemed stuck in time, that is a part of America that progress has passed by. 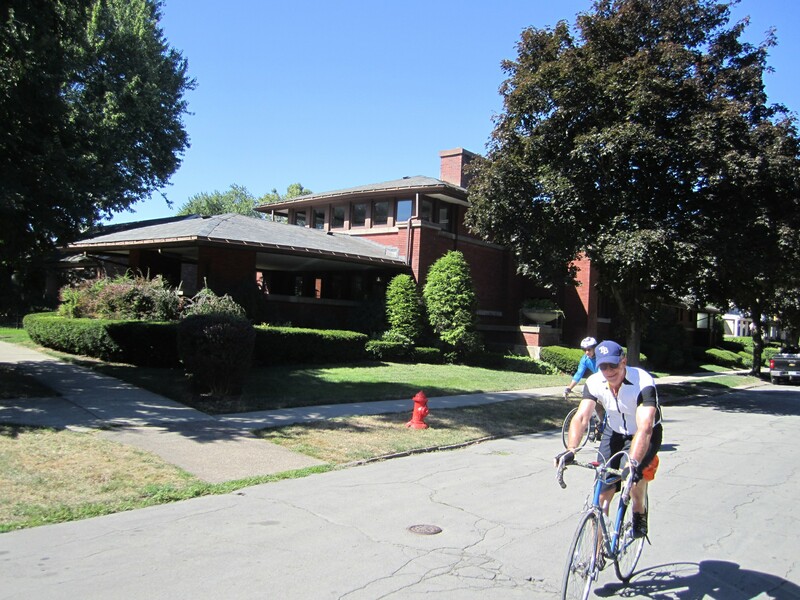 There are at least six Frank Lloyd Wright buildings in Buffalo proper, and Lyman and I rode around to see some of them on Monday. We saw an additional house in Rochester three days later. 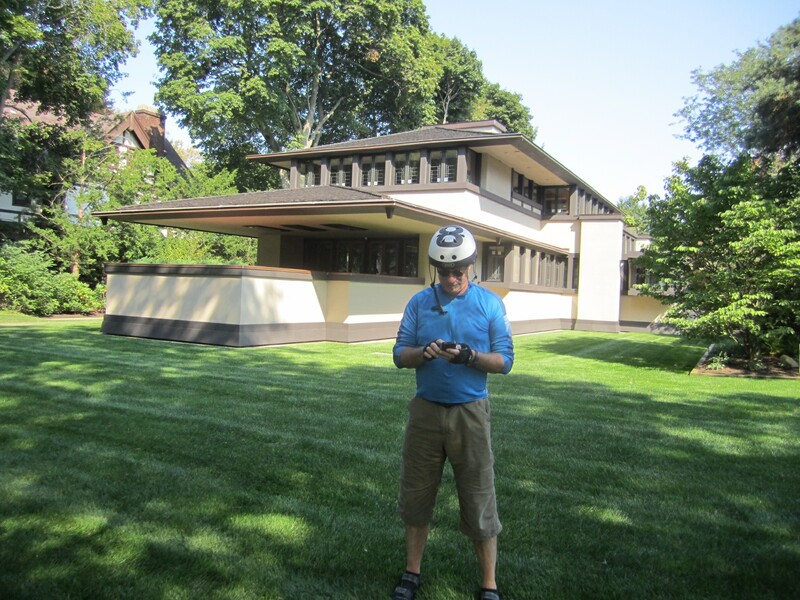 These are all Prairie School buildings, from his 1900-1910 phase. Lyman the architect described how Wright pushed the feasibility envelope on his cantilevered designs; he said most owners have had replace the the original wood support beams with steel, in order to keep the houses from falling down. These houses were stuck like curious gems into neighborhoods of otherwise conventional rich people’s houses of the same era. 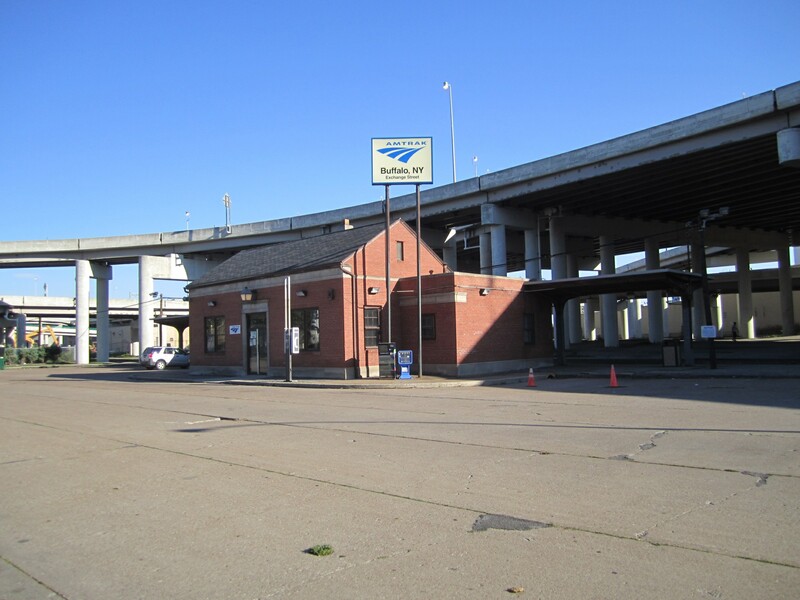 Buffalo Central Station sits three miles from downtown, in a direction it appears few people ever go. The side of Buffalo most people visit, the North and West side, is full of leafy neighborhoods, bars and restaurants; even Frank Lloyd Wright houses! Go to downtown, which is somewhat depressing, and then turn the other direction, south and east down Broadway, and you enter another dimension. The street ceases almost immediately to have buildings alongside it; it is like entering the countryside right next to downtown. 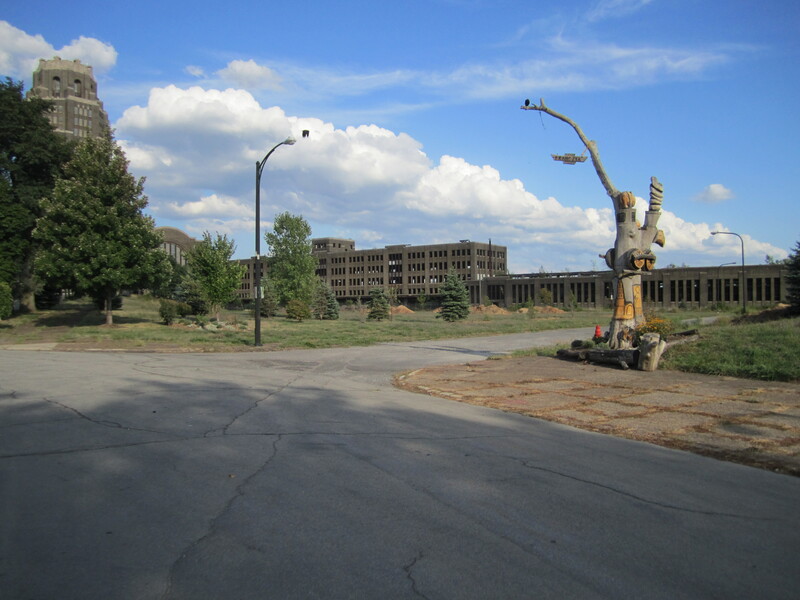 Redevelopment has torn down most of the buildings but replaced very few. There are very scattered newer suburban style houses, mixed with the odd preserved iconic building, sitting by itself in a field. There were one or two prominent Catholic churches, sitting abandoned; fenced in for preservation. Young men in oversize white tee shirts loitered around on the corners. Lyman and I rode quite briskly at about six PM through this somewhat threatening scene, occasionally having to stop and check the map on my I-Phone. We finally did arrive at our planned destination. Central Station sits forlornly by itself at the end of a wide dead end street with no cars, overlooking some slums. The empty office tower is seventeen stories. The empty central waiting room was said to rival places like Grand Central Station in New York City. Buffalo Central Station was built to process 3200 passengers per hour. It was put in this remote location because it was thought that the rapidly growing Buffalo of 1927 would catch up to it. The current citizens of Buffalo have done a good job of raising enough money to at least lock the building, to prevent further vandalism. They sometimes even use its central hall for things like parties and art shows. It is large enough to have a regulation hockey game on the central floor. But the building this day was locked, so all we could do was circle around it on the bikes. 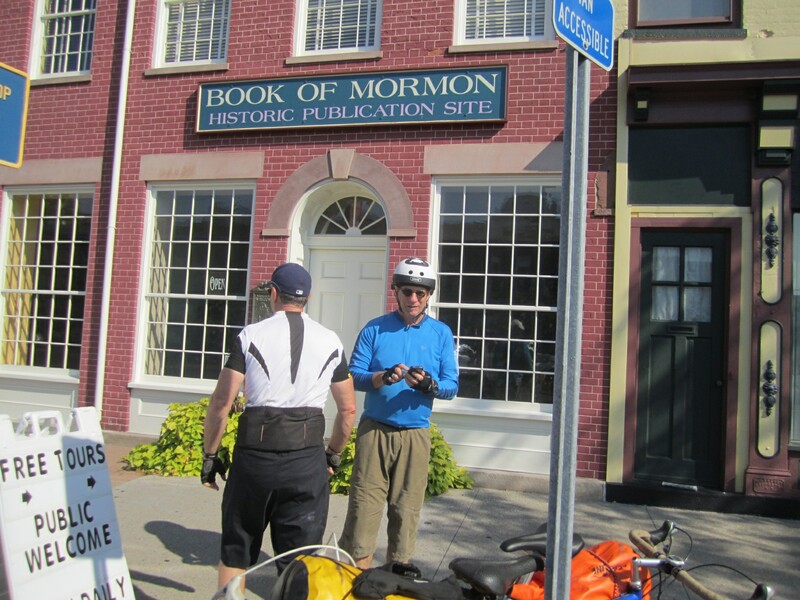 There is an 1830 print shop in a storefront downtown that printed the first five thousand copies of the Book of Mormon. We met a very cordial young woman who gave us a half hour tour of the building, showing us the 1830 printing press, and describing to us the depth of her faith. She is from Utah; she was there in Palmyra on a two year assignment. On leaving, we thanked her for the tour, and we passed more staff of the printing museum, including one older man whose look of certainty combined with authority kind of gave me the creeps. It was a hot day, but we could not be prevented from searching further for Mormon sites. We cycled to a large temple about five miles out of town, but skipped visiting that and the Smith farm, (although we did use the restrooms there!). 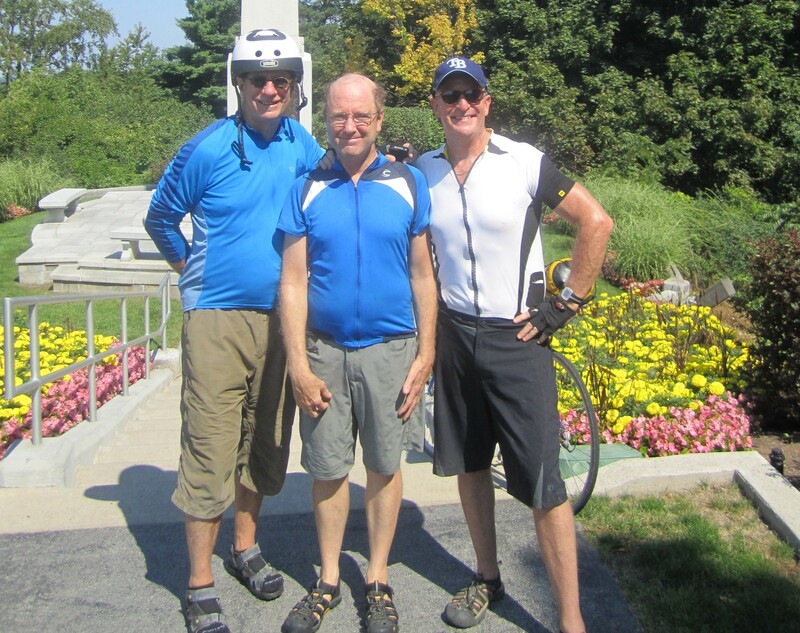 We instead pedalled up a large hill to the prominent statue that commemorates the arrival of the angel Moroni. Some friendly Utah visitors corrected our pronunciation of the name of the angel, which is pronounced mo-ro-NY. Steve took their picture for them in front of the statue. Lyman told me he has had two lives, and is getting ready to start the third. A New Orleans native (Gentilly!) (Brother Martin!) whose family there goes way back, he graduated from college in the early seventies. 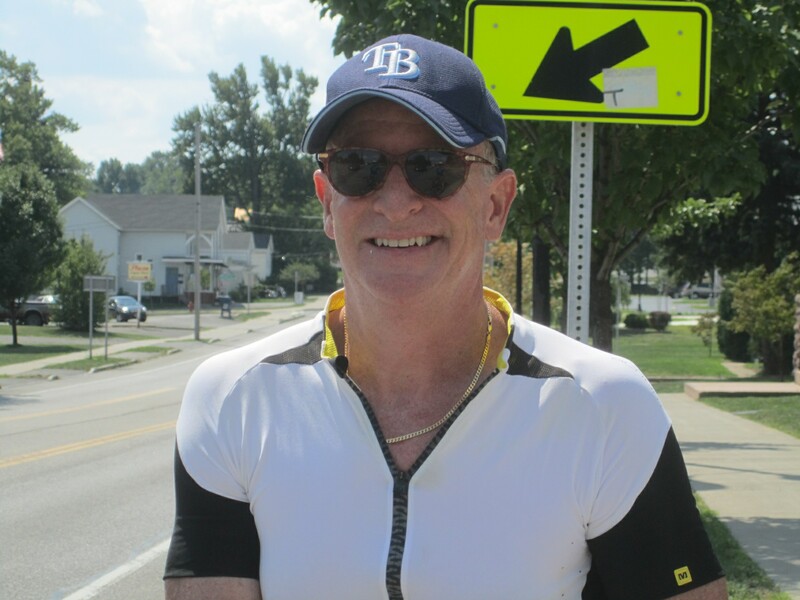 His first life continued when he worked for a steamship company (where he met Steve) before continuing on to start his own real estate company. He said he had as many as twenty agents working for him before his divorce and the crash of the New Orleans real estate market convinced him to shut it all down in the late eighties and escape for a second life in Austin, Texas. There, in his thirties, he went to UT architecture school and became an architect. For the past few years he has worked for the Texas Historical Commission, a state agency, helping to restore the monumental courthouses that are in the county seats of all 254 Texas counties. Now at a relatively young age, he has qualified for retirement with the state, and is looking forward to the new adventures of his third life, probably to be based still in Austin. I first met Steve at the Princess Anne Country Club swimming pool when we were both about twelve years old. He is from a Navy family, and before landing in Virginia Beach he had the stress of moving constantly, including living twice in France. Because his sister is ten years older, he was essentially an only child. Steve is an alumnus of Episcopal High School and got his undergraduate and law degree from Tulane University in New Orleans. Steve has since continued to live all over the place. We used to joke about guessing how many different apartments he had lived in in just New Orleans. He worked as an attorney at multiple law firms in New Orleans before moving to Houston and then Saudi Arabia. He has two wonderful children, now grown, who spent their early years at the Aramco compound in Saudi Arabia. He has been back from Saudi for quite a few years now, and since his return has lived in New Orleans, Orlando, West Palm Beach, Gainesville, Salt Lake City, Bali, and maybe a couple other places I forget. His career has been fruitful, and he now is splitting his time between Salt Lake City and Bangkok, while visiting his son in New Orleans and his daughter in California. Every morning on our bike trip he called his girlfriend in Bangkok, talking to her in broken English. Steve’s most recent revelation is the “paleo” diet and lifestyle. This (I hope I get this right) means we should return to the diet and exercise of the hunter gatherers. For exercise, you should not run continuously, but do lots of stops and starts. For food, this means fruit, vegetables, and meat, but no bread. Personally, I try to eat right. I try to shun bacon, sausage, red meat, and butter, and try to be heart healthy. Steve throws this pretty much out the window and says that it is the grains that are killing us. No wheat, no rice, no oats. Steve looks fit and healthy, so who am I to argue? Every morning Steve would get bacon and eggs, no toast. I would eat oatmeal. 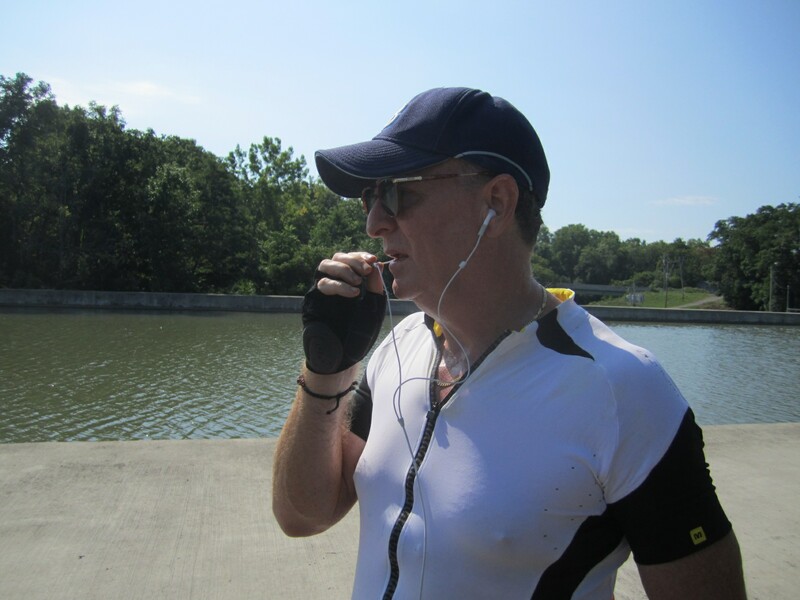 Steve would conduct various complicated international phone calls while cycling down the Erie Canal towpath. In one morning he was calling his furniture broker in West Palm Beach, his son-in-law in Los Angeles, his girlfriend in Bangkok, and his landlord in Salt Lake City. He was also working on some land deals in Indonesia. Steve is a great storyteller. Some stories are classics from his childhood. His description of drilling a hole in his bedroom wall so that he could watch TV in the next room remains incomparable. I like the way you live. Great stories, great people, and you write so well about it all…I just want to be there!